Why go to Ominous Mountain State University? Why not go to some other school with a funny-ish name, like Ball State? Why not go to a school people have heard of, like the Colorado School of Mines? Why not just play XBox all day and get your high school girlfriend pregnant? At least the answer to that last one is easy: she thinks “original” spelling of a too-trendy baby name makes the kid special and you just can’t bring yourself to sign a birth certificate for a Dylon or Ayden. If you’re the girl, it’s because Call of Duty doesn’t have built-in diaper-changing breaks. Gay? The story breaks down, but you get the point. According to the statistics, your average high school senior could do a little better than OMSU, at least on paper. Come April, the brighter lights among you will tell proud family members that you’re going to this or that college for the advanced physics lab. Or the archaeology trips to Myanmar. Or the brilliant author who only teaches seminars of four (or fewer) students – outside on the quad! Pity those deluded wannabe-overachievers. The odds are that if you’re jazzed about the shiny new particle accellerator buried deep under campus next to the WWII-era steam tunnels every school seems to have unverified stories about, you’ll switch majors after one semester and end up with a B.A. in Communications. The prettier among you will become pharmaceutical sales reps. Here at OMSU, we do not have our own satellite hovering in low-earth orbit. Our most esteemed faculty author wrote Do-It-Yourself Bedbug Eradication for Dummies. The faculty wears patches on the elbows of their tweed jackets to cover up actual holes. 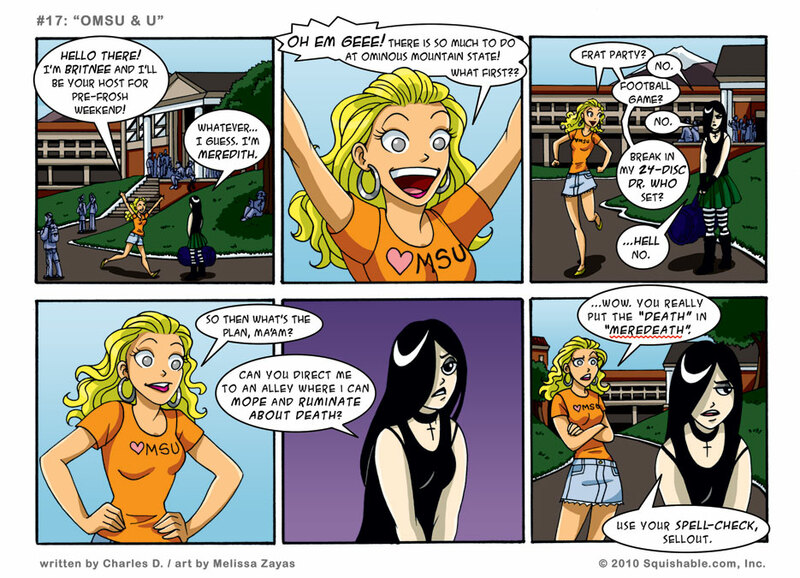 Sure, OMSU is just one big punchline, but it can be your big punchline. If, by some miracle, you reach the commanding heights of corporate America, you can lecture sycophantic underlings about how easy they have it compared to you. After all, you spent your undergrad days looking for a capella tryouts in a student union that doesn’t exist (we put up those flyers to provide more of a “campus atmosphere”). If, on the other hand, you find yourself sleeping in your mom’s garage at the age of 30, who are you going to blame for not hiring someone who graduated from OMSU with a 2.3 GPA and a degree in modern dance? A lot of schools talk about a personalized education, but we deliver. Whatever you do with your life, the fact that you went to OMSU validates your personal success or justifies your failure. It’s up to you. That’s the Ominous Mountain State University difference! There is nothing visibly fuzzy and blobbular in this comic. I have been gypped. @cmcl, maybe her Squishable is in the duffel bag.. though that’d be a waste of space, since squishables want to be free, and because she’d only have half of the duffel for her actual, yknow, stuff. Squishables are a high commodity in Fluffton. It’d be like walking around flashing a diamond necklace. I would say that this is something out of left field, but I’m not sure that OMSU has a baseball field. Ahhh, I sort of miss undergrad days. Maybe I should go back to school at OMSU. My Squishable collection would provoke envy! @maya i took mr. shortneck with me to Vienna. And yes, he took up half the space in my luggage. But it was worth it. Esp when we were in Bratislava running around looking for their famous statues to take photographs with! @Zerainian: I also feel that it’s not the same without the presence of a Squishable. I mean, I thought it was funny how there’s a preppy girl and a goth girl, but the Squishable makes it all happen, supposedly the fox? ‘m assuming goth girl will be the future love interest of vampire boy? Not to give away too much, but the squishables are just taking the day off to fly to Squishable World HQ for Thanksgiving. Next week, they’ll be back. You worked in Dr. Who! I love this strip. Aww, Gothy, I’m disappointed in you. One does not say “Hell no” to the Doctor! YES! Dr. Who is amazing! Shame on Meridith!! No one disses the doctor! Thou hast denied the Doctor. Thou shalt PAY. What’s wrong with the Doctor? That blonde may be annoying but I’d ignore that for 24 disks of Doctor Who.